Millions of people mainly know him as “Potsie Weber,” one of the stars of the hit 1970s TV show Happy Days. But Anson Williams has had an extraordinary Hollywood and entrepreneurial life off the screen. He has directed more than 300 hours of television -- from Star Trek to The Secret Life of the American Teenager -- and co-founded StarMaker Products, makers of a variety of beauty and wellness products. Still, Williams attributes his success in large part to an unusual mentor: an alcoholic, illiterate janitor named Willie Turner, whom Williams worked with at Leonard’s Department Store in Burbank, Calif., when he was a teenager. 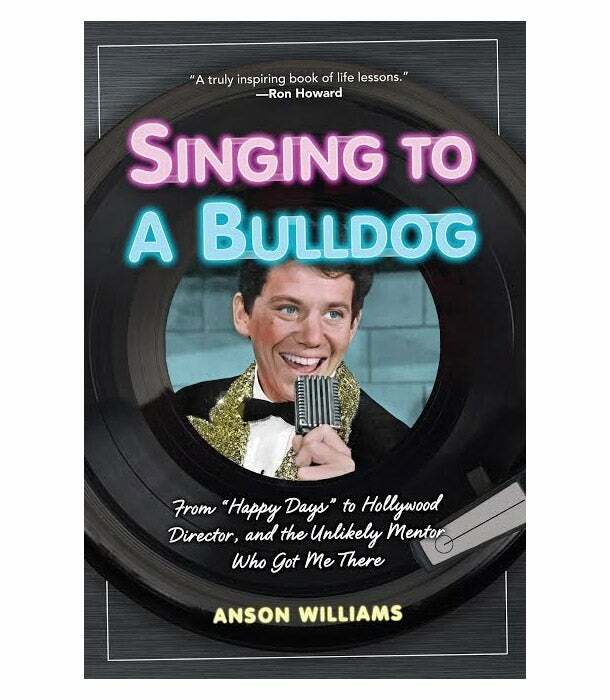 Williams’s entrepreneurial and life lessons -- many learned from Turner -- are sincerely and humorously recounted in a new memoir, Singing to a Bulldog. I had the chance to speak with Anson and he generously expanded on some of his greatest entrepreneurial lessons, which are summarized below. While you may be waiting to be taken under the wing of a Richard Branson or Marissa Mayer, Anson believes you should rethink your mentors. Willie Turner, the janitor at the department store, is the unlikely person to whom Williams attributes his own success. While an illiterate, alcoholic janitor probably doesn’t fit your archetype of the ideal mentor, Williams says that Turner was the first person who believed in him. While at home he was made to feel like he was a failure by his father. At work, Turner’s positive energy and common-sense approach and lessons are what pushed Williams to succeed. He says to trust your instincts and to keep yourself open to anyone who can help you become the entrepreneur that you were destined to be -- and that most likely isn’t a big fancy name, but an ordinary person with an extraordinary perspective. Go left when everyone else goes right. One of Williams’ first big auditions was for a summer stock play. When he couldn’t remember the lyrics to his audition song, he just made them up as he went along, showcasing his humor and personality. He did the same thing at the dance audition, being willing to make a fool of himself among professionally-trained dancers. Standing out is what got him noticed for his first paid gig and helped him to advance his career -- over and over again. Williams advises entrepreneurs to embrace this philosophy and define who you (and/or your product and company) are to stand out above the noise. Sometimes, there’s a better way to get there. When it was picked up in its new incarnation around two years later, Happy Days had the necessary ingredients to not only succeed, but to be a breakout hit. When you are stuck with your business, know that there may be another, better way around the corner. Be willing to give away the credit. One of the earliest lessons that Turner taught Williams came via a piece of paper on the wall of the janitor’s room, which said, “There is no limit to what a man can do or where he can go if he does not mind who gets the credit.” Years later, when he saw the same message on a plaque on President Ronald Regan’s desk, Williams knew it was a lesson to live by. Williams reminds entrepreneurs to focus on the outcome instead of ego. Let other people indulge their egos, but stay focused on the big picture of what you want to have happen and be willing to give all of the credit away in order to create the outcome you desire. Williams’ first foray into entrepreneurship was conceiving a fast-food chain “Big Al’s,” which was based on the character Al Molinaro who ran “Arnold’s” on Happy Days. It was a great concept, but not knowing what he didn’t know caused him to contract with a fast-food consultant who seemed perfect on the outside, but was a shady gambling addict. By putting control of the business in the hands of a man who seemed “perfect” on the outside, but without doing due diligence, had the consultant skimming the profits and ultimately declaring bankruptcy, leaving Williams and Molinaro responsible for the debt on the chain. The men lost all of their investment and almost everything else. Finally, Williams believes small businesses are uniquely positioned to capitalize upon opportunities left behind by the big companies that become too mired in their own politics. Keep your eyes out for opportunities and pay attention to small things that are unique. When Williams created “Cool Flash for the Hot Flash” topical cream as a natural solution for hot flashes, he drew upon an unusual remedy an on-set medic used when he was shooting a production in sweltering desert heat as his inspiration for the product. He advises entrepreneurs to be observant and do everything to remember interesting facts. As a small business, you will be nimble enough to take advantage of them when the time is right.